Keeping track of everything from your technicians to your customers and equipment can be tough. Scheduling with all of that information? Now that’s difficult. Smart Service helps make this process easier by combining the scheduling and work order process. When you create a job on Smart Service, information stored from QuickBooks automatically populates the work order. This work order, filled with handy information like equipment, locations, and assigned technicians gets put on the schedule. And just like that, your office is on top of things and ready to go! Don’t work for your schedule when your schedule should work for you! Smart Service work order software uses customer data on QuickBooks to create functional and effective schedules. That way, your team is prepared for the job and has everything they need to know on hand. Jobs can be easily scheduled without the unnecessary hassle of calling and recalling (and recalling again) the customers and your technicians to make schedules work. And your technicians will be happy that their schedules are orderly and their work orders are well-stocked with useful information. When you get a phone call for a new job request, you can assign that to any technician. If it is a large job, you can even schedule it for multiple technicians! With QuickBooks integration, simply type in any piece of information of the new job (whether it be client name or location) and the rest will automatically populate. Easy, isn’t it? You can drag and drop that job anywhere on the schedule. Don’t know when the best time would be? Smart Service can tell you when and to what technician would be the optimal assignment. 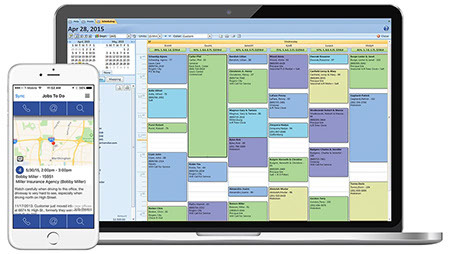 Scheduling technicians has never been easier. With iFleet, the Smart Service mobile app, your technicians have the power of the office in the palm of their hands. Communicating and scheduling new jobs is easy. Dispatchers can view a technician’s schedule, stage of job, and even their location. So when they get a phone call for a new job, dispatchers can easily see who to assign it to. Then all a technician has to do is approve it on their mobile device! They can view their job, take notes, and even fill out forms digitally. Tired of handwriting you can’t read? You don’t have to deal with that anymore! Technicians can collect payment from customers on the job. Find out how Smart Service can make your business operations even better! Request a free demo of Smart Service today! Tired of reading work orders? Read these useful field service tips and tricks instead!